The Perfect Sphere Tool comes in several parts, comprising a mounting plate, way spacers, swing arm, upright riser and cutting head, together with several Allen screws and a bolt. The swing arm and mounting plate are aluminium and the remainder steel. The cutting tool is a Hunter Tool No.4 carbide cutter. 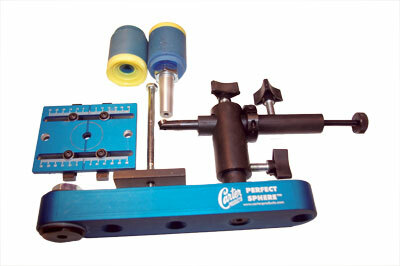 The tool has several components that combine to form a sphere turning system. The tool can also be used to cut concave forms in work, such as bowls, but this aspect wasn't tested. These items are manufactured in the USA by Carter Products. The strength and design allow the turning of spheres from 12-360mm in diameter on most lathes from 255-635mm swing size. 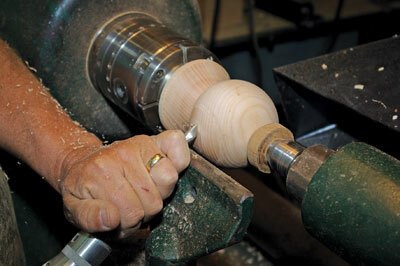 The lathe used does need twin bed bars as the mounting base fastens between the ways. On the website, the manufacturer says that due to the mounting height, the largest diameter sphere you will be able to turn is your lathe swing height minus 50mm. For example, for a 305mm lathe, your max. sphere would be 255mm. The mounting plate is fitted by adjusting the way spacers to centre the mounting plate. The system is designed to be fitted to lathe beds that have the central gap of the bed in line with the spindle - the majority of lathes have this but I used a lathe that had it offset and had a plate made specially for it. The swing arm has four holes, which allow the sphere size to be varied. The tool can also be used for hollowing using a specific hole and the blade arced into or out of the wood, depending on grain direction, but as mentioned, this was not tested. The upright riser was then fastened onto the swing bar with a flat-headed bolt. There are seven different lengths of riser available to accommodate most lathe swings. The tool is supplied with a riser - you select which one you want when ordering - to suit various sizes of lathes. 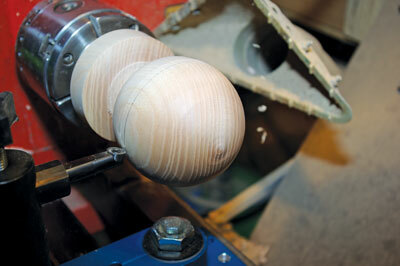 The riser needs to match the lathe swing and enables the cutting tip to meet the lathe's centre height and has nothing to do with the size of the spheres to be turned. One thing I noticed was that the system uses four different size Allen keys, which can be a little tedious. Note to manufacturer - could the number of variations in key sizes be reduced? You have to prepare a blank to start with so a 75mm section of ash (Fraxinus excelsior) - slightly wider than the sphere required - was chosen and a spigot was cut to fit it in a chuck. A centreline was then marked on the cylinder to highlight the centre of the sphere and the two outside ends of the potential sphere trued up with a parting tool - the chuck end only parted partway through. The corners were then rounded off with the right-hand, tailstock end, being turned away fully and the left-hand side, headstock end, section was left at around 20mm diameter. With the cylinder prepared, the centre of the sphere was marked with a pencil both around the vertical circumference and at the tailstock centre. This, along with a set-square, enabled the cutter head tip to be set up square to the centrelines in both orientations. It took several attempts and some practice to line the cutter up in both orientations simultaneously. It was a little like learning to ride a bicycle, but once mastered, it seemed easy. The aluminium swing arm has a centreline scribed into its top surface to enable the use of a set-square to position the swing arm perpendicular, at 90°, to the lathe bed ways. Once the tool is aligned, the cutting head is mounted back onto the riser post, far enough back so as not to make contact with the cylinder. The tool was then rotated to make sure it didn't touch the cylinder ball, at any point; once this is achieved the cutter head was slowly adjusted forwards until it just started to make contact with the wood. The lathe was then turned on - around 700rpm seemed OK - and the process of swinging the cutting head from side to side started. As with most things, a technique started to develop with practice. There is a tendency to press down or lift up on the swing arm while rotating it from side to side; this must be overcome, as the smallest amount of pressure caused the cutter to either lose contact or gouge into the cylinder. I found that pushing the tool with my left hand while holding the riser with my right reduced the vibration. As each cut was made, the cutting tip was wound forward by a small amount and the process repeated. When moving the cutting head around a little downward pressure reduced the contact while a little lift increased it; this was used to facilitate the control of the cut. The cutting head can be straight or rotated to 25°; this was useful when making the final cuts at the headstock, spigot end as it enabled the cutter to move further into the cut. Vibration was reduced by keeping the cutter tip as close to the riser bar as possible. The tailstock end was finished first and the small remaining nub shred off with the cutter. I didn't do so, but a revolving cone centre could be used in the tailstock to support the sphere until it was time to part off the headstock spigot. Experience soon showed that it was worth pushing the toolrest banjo to the headstock end of the ways before fitting the sphere turning tool to the bed bars. This then allowed the remaining spigot to be reduced in size as the sphere making progressed. A larger spigot was required initially in order to reduce vibration, but as the sphere was finalised, the - headstock - end diameter can be progressively reduced; this makes the final remounting and finishing an easier job. We used the tool at a club night and, in addition, a friend who had never made a sphere previously wanted to try the tool. 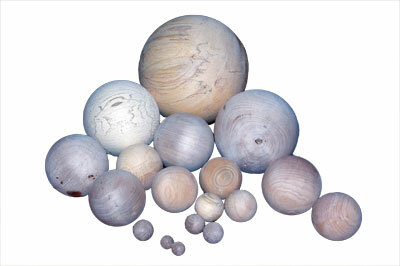 In total we made 20 balls varying from 6-200mm in several different woods and were both delighted with the final results. The spheres were cut off, once the rounding process had been completed and the spigot stem was left at around 5-20mm, depending on the size of the sphere. The spheres were then mounted between two shaped wooden cups. There are two dual density urethane chucking cones supplied - headstock and tailstock - to enable the completion of the spheres previously prepared on the sphere system. These were not tested as the Morse taper didn't run true and the supplied thread didn't fit my revolving centre. Once the sphere was mounted between the cups, it would have been possible to realign the sphere tool to the centreline of the sphere to turn off the remaining nub. I found it quicker to turn off the remaining wood with a gouge. The sphere was then rotated in the cups several times and sanded through the relevant grits of abrasives until finished. I think I had more enjoyment from this tool than any I have tried or tested. It does take some time to master, as do many tools, but once the initial setting up is resolved and the techniques practised, the results are very good. I have tried - and own - an alternative sphere cutting tool but the Carter Products version is far superior: the tool cuts rather than scrapes and the final finish on the wood is excellent. Overall, the tool was impressive and as I turn spheres regularly, this is definitely a tool I would like to own. You can also see various video clips on the website, which show the system in use. See details opposite.